Janapada in Hinduism is the seat of the people. The term has different meaning in different scriptures. The term of janapada is of great importance as it gives the sense of a nation or country in Hindu scriptures and classical Sanskrit writings. Janapada (territory of state and its people) is one among the seven constituent elements of a state. 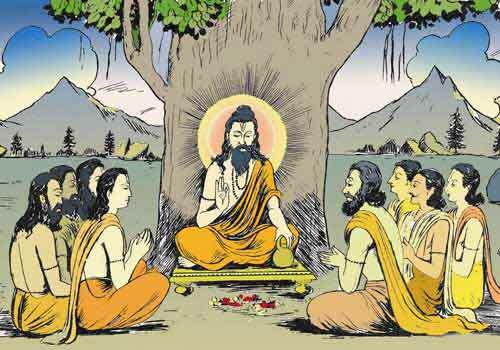 Jana besides meaning man as an individual, commonly denotes the collective sense of a ‘community’ or ‘people’ in the Rig Veda. In Aitareya Brahmana 8.14 and Satapatha Brahmana, the term Janapada denotes both people as opposed to the king. The term gets the connotation land or realm in Taittiriya Brahmana 2.3.9.9 and in Chandogya Upanishad 5.11.5. In the post-Vedic texts, the term janapada is used in the sense of a political community or a nation, a country or the territory of a state. Its interpretation as gana or republic can be seen in Ashtadhyayi. Panini calls Yaudheyas a janapada (4.1.178). The words pura or nagara (city) and durga (fort) are occasionally used as opposed to Janapada; therefore, it also gives the impression of a village or countryside. For instance, Jatakas mention janapada and nigama, Arthashastra (2.1.2.3) refers to janapada and durga, and the Ramayana (2.79.12) to nagara and janapada. Janapada in Kautilya’s Arthashastra was used in the sense of a territory to be colonized and as one which was either included within the kingdom or not included. According to Amarakosha, the word desa, rashtra, vishaya and janapada are synonyms. Kalidasa too uses the term to describe a country. Kavyamimamsa employs the word janapada for the names of countries in the four quarters of India.